An A-shaped frame with supports under the gunwale and the nose. Some use the term 'stackable' trolley. Most are made from steel and are galvanised. An alloy trolley that can be detached. Mostly T-shaped with a sling to support the rear of the hull. Currently, we use type 1 and 2 together: driving the car + trailer + boat on the A-frame to the venue. There we lift the boat off the A-frame onto the T-frame. Lots of sand here (beachy...). The A-frame trolley is the one to have when you transport your boat 'the correct way up' on the trailer. The boat + A-frame trolley are loaded on to the trailer and secured for transport. That provides enough support to haul the trailer + trolley + boat safely for thousands of miles. The T-shaped trolley is the one you need when you transport your laser 'bottom-up' on the trailer. You can then detach the trolley and carry the parts in the trunk of the car. Do not use the T-shaped one as support for your boat on a trailer for long trips! The construction of the trolley is not designed to dampen the bumps etc at high speed (As I have seen when the Italian crew arrived in North Germany last year: the welding of two trolleys had sheared off). it's much lighter than the A-shaped one, making hauling the whole contraption in the sand a lot easier. The second advantage is the easier way to launch yourself off the trolley. You can push the boat + trolley out into the water and -when on the T-shaped one- the boat will come off the trailer (it's only resting on the sling!) and you can sail away without the need of going overboard and lifting the boat off the gunwale supports (like on the A-frame trolley). When you're capable of welding, you can consider welding your own trolley. Here's an example with drawings! Trident UK Perhaps that helps to cut down the costs. Let us know how things progress! You don't fundamentally "need" a trolley, covers, bags, etc. to go sailing... but they do make life nicer. You want something on which to lay the boat onshore anyway, and you might as well have wheels on it. Back in the 1980s few used trolleys in the class (there always seemed to be someone there to help with the lifting! ), but then the very light fibreglass/PVC trolleys hit the market and changed the culture so to speak. I don't think the currently available aluminium-frame trolleys are prohibitively expensive; they last a long time, and an old one doesn't even affect your performance like an old sail does. Menno's post above is pretty exhaustive. Read it again! Nice! How did you attach the wheels!? My Seitech dolly was a pricey purchase for me when I bought it over 20 years ago, around $250 or so. I think the modern Dynamic dollies go for about $500. Still, it was a great investment for me over the years. I've owned 4-5 different boats but kept the same dolly. It has saved me a lot of hassle when launching and retrieving over the years. 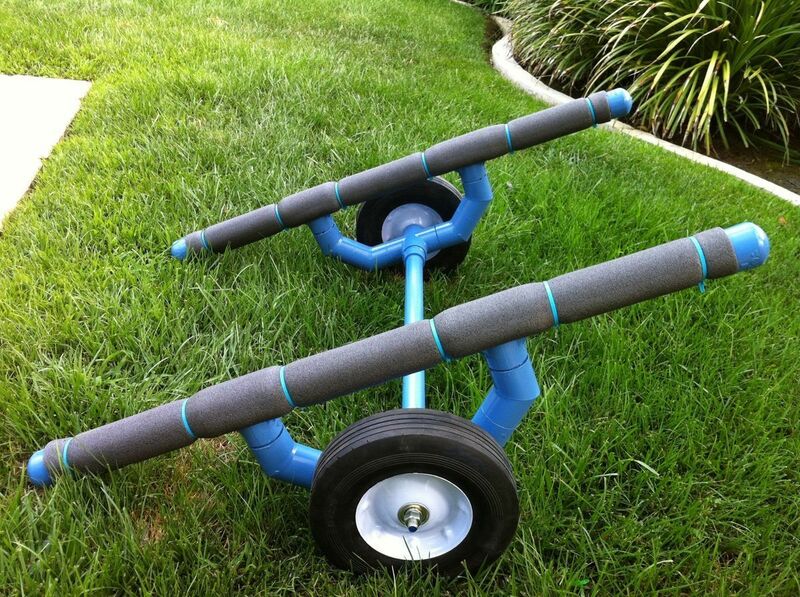 Lots of people make homemade dollies from PVC pipe. This is a great option if you are limited on funds and need a way to launch the boat. I've seen lots of clever designs, but they all seem to fall apart after a year or two. How do you carry your boat? I have two boats, and different handling strategies for each. I don't have beach wheels (ie a dolly) for my catamaran. I launch directly from the trailer. That works best for me as my local lakes don't have beaches (one is surrounded by rocks set in concrete, which is awful for launching boats except via the boat ramps); generally, I step the mast on the trailer, back it down the ramp, float it and tie it up, then hoist sails and rig on the water. My Laser is for club racing; the club yard (on the lake with the rocks) has a concrete beach. It's set up for dolly launches. My Laser sits on the dolly on the trailer; I pull it by hand from the carpark to the club yard to rig and launch. If I want to take the catamaran to the club yard, I sail there from the boat ramp. Too hard to get it to the water through the yard otherwise. I don't know how I'd launch the Laser if not for the dolly and yard/beach. Probably the same way as I launch the cat; float it off the road trailer down a ramp. If your Laser is on a road trailer and you have a ramp, that's probably all you need. If you don't have a road trailer... It's not the most convenient thing to move around unless you have wheels under it, surely? A dolly (US speak) will keep its value pretty well and will make it easier to sell your boat, once that time comes. I wouldn't buy a second-hand boat without a dolly (trolley ). The reason is simply that I would be scared of hidden problems because the boat could have been dropped or similar somewhere in its life. In my eyes 'no dolly' is a sign of 'uncareful ownership'. Perhaps I'm jumping to conclusions, but I have the idea that other potential buyers will think the same.